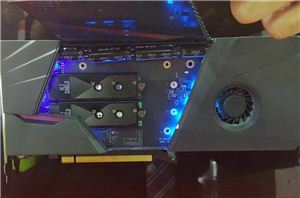 A surprise at Computex was seeing the first public AMD Ryzen-based AM4 motherboard that will implement an Aspeed AST2500 BMC chip for additional management. Tyan was showcasing its Tomcat EX S8015 motherboard at its booth, initially with a version containing an onboard embedded Radeon E8860 graphics chip, but in the future a version with a BMC will be available. For almost all servers, some form of management control is added to allow for the server to be adjusted outside of the central system. This management control boots a separate subsystem that can power off/on the main machine, manage networking, and also track users or onboard sensors for fans/thermals and report back to a central server. They also typically support interfaces to interact with the main machine directly. 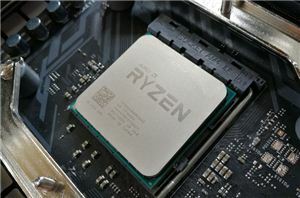 Up until this point, almost all motherboards we have seen have been Intel or EPYC, although we have suspected that some enterprise users might want to invest in a Ryzen system with similar features. Tyan is the first company to make their Ryzen+BMC product public. 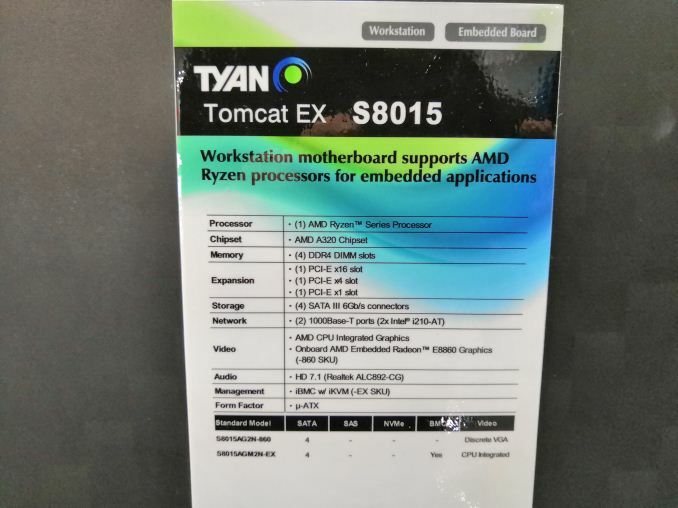 The Tyan Tomcat EX is based on the A320 chipset, showing that it is perhaps more for the lower end of the market, but does have dual gigabit Ethernet and a full set of memory slots. 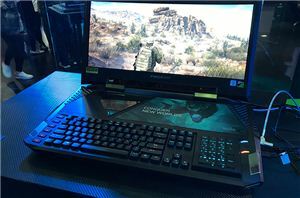 The big thing with the fan is the E8860 graphics in the embedded graphics version, but Tyan stated the BMC version will be in production in September this year. It is worth noting that we would expect both versions of the motherboard to be built on the same base PCB design, however this PCB does not seem to have room/pads for a BMC module. We were told that the unit on display is an early revision, with the BMC chip to be added later somewhere around the audio jacks. 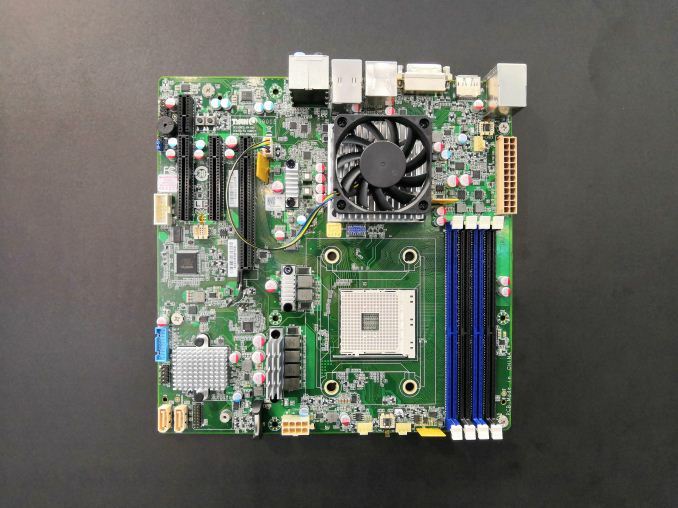 We do expect other companies to make similar motherboards in time; we may see more at Supercomputing later this year.